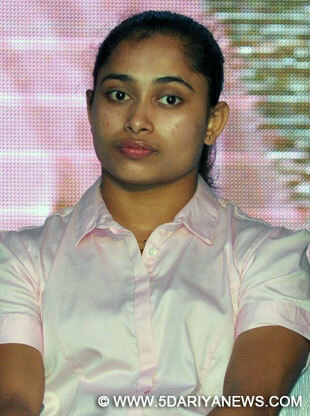 Ace gymnast Dipa Karmakar on Saturday said her rehabilitation has been completed and she will join the training camp at the Indira Gandhi Indoor Stadium in New Delhi on December 11 to prepare for next year's Commonwealth Games. "My rehabilitation is complete and I started my training from 1st December. I will be joining the camp in Delhi from next week on December 11," Karmakar told reporters at a college felicitation programme here.In Rio 2016 Olympics, Karmakar created history when she narrowly missed out on a bronze medal in the women's vault event.The 24-year-old Tripura girl, who became the first Indian woman gymnast to qualify for the Olympics, finished fourth in the final round of the women's vault event.In April this year, Karmakar underwent surgery in Mumbai after injuring herself during a national camp in the capital.Therefore, after the high of Rio, Karmakar could not compete anywhere due to an Anterior Crucial Ligament (ACL) injury in her right knee. "Injuries are part and parcel of a sportsperson's life. I have now come out of it and I feel good after resuming training. "I am mentally more focused to achieve bigger success. My coach (Bishweswar Nand) takes care of everything and plans the vaults for me," Karmakar said. Since undergoing the surgery in April she missed the Asian Championship and also skipped the World Championship in Canada.So far, Karmakar has mastered Tsukahara 720 and Handspring double front, which includes Produnova move. She said, she is now working on the new vault, Handspring 540.Asked if being out of competition for such a long time would be a cause of worry looking ahead to 2018, Karmakar chose to speak about the next generation gymnasts. "The next generation of gymnasts are very promising. The came fourth and fifth in the recently concluded Asian Championships. "I am hopeful we will have more gymnasts coming from India as we are heading towards the right direction," she said.Karmakar added that infrastructure has improved a lot since her feat in her hometown in Agartala. "After Delhi, I think we have the best apparatus now in Agartala," Karmakar said.Quizzed about the ACL injury, Karmakar said it's not a big concern for her. "Even (Cristiano) Ronaldo suffered ACL injury. So that's part of our lives and we have to get over it."